Disqus is a third party commenting system, used on a lot of popular blogs including TechCrunch, ITProPortal and of course Sporkings! The idea is that no matter what website you comment on, you get to use the same login details. This is an OpenID approach to commenting, that has been very successful. But with the launch of Echo last month, it seems Disqus felt the need to up their game a little. One of the better features is the improve comment management system. Now by visiting your disqus profile page, you can view all the comments you’ve left throughout the different websites you frequent, and use one of the quick-links to jump to your favourite blogs. The new ‘Profiles’ provide a feeling of control over your web presence. If at any point you wish to dissasociate yourself with a blog or your comment on a blog, you can delete it – this will cause the comment to become annonymous. Disqus will also discover any comments you left by signing in with your Twitter/Facebook details, and integrate them into the Profile page. Another exciting feature is the live-updating comment feed. You can now watch comments appearing as they’re posted, keeping the conversation current. This is the feature that gave Echo all the hype last month. So it seems Disqus have matched Echo feature-wise, and then some. Probably the best part of this update for websites like ours, is that it only take the switch of a theme on the Disqus panel. No updating files via FTP/SSH or any of that nonsense, just the simple switch of a button. Nice. Thank you for the post, I liked reading your blog! do you participate in link exchange programs? Disqus has ability to import existing comments as well as export comments. I didn't lose any comments when I moved to Disqus..Disqus is really good stuff methinks! 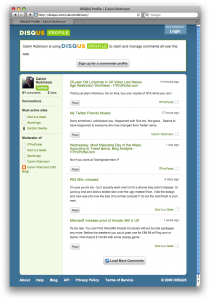 Disqus now brings us the ability to comment using your Twitter account. You don’t have to give up your actual Twitter credentials since Disqus takes advantage of Twitter’s support.. Simply superb tool. easy to understand whether link gets in or out. especially edit option is nice one. how about symbian integration ? SEO services should ensure that the quality of their services does not keep anything to be preferred by the consumer. They embrace a lot of actions to be able to decrease the cost of solutions which are offered by them. communitiesbuy world of warcraft gold like Stack Overflow. In diablo 3 gold, you will be limited in the number of sales at auctions, you can have up to at the same time. Thus, anything that doesn’t sell not fast allows you to block one of your locations in sale for 48 hours or until you cancel the auction. There is nothing to put something in place that is not the least expensive of its category if you really want to make a sale. You can buy d3 gold here when you need.Put something in place for a price where you think he could sell later, when prices rose, has meaning if you do not intend to be online for a while anyway.